I heard that Jack had an interesting Village story, but before interviewing him, I had no idea how many life adventures this joyful and well-spoken man had. It was captivating to hear about his globetrotting stories around 40 countries while he was in the military and his memorable years in Germany and Asia. I was also very excited to hear his Village story and share it with you. 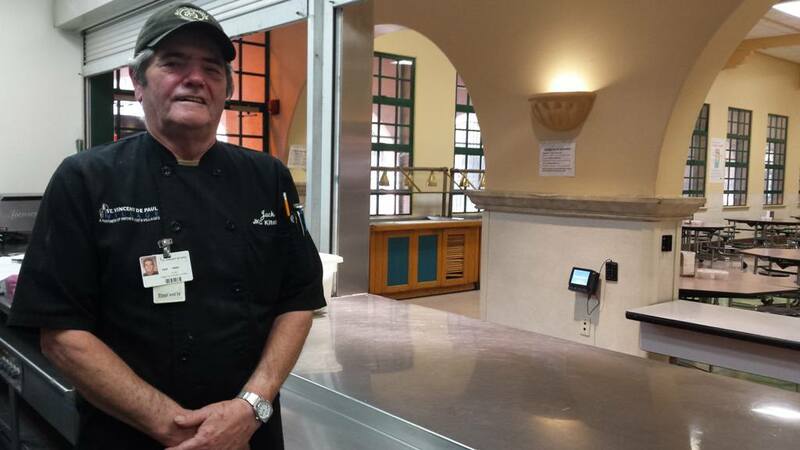 Jack’s journey with St. Vincent de Paul Village started in 2004, right after a life-changing situation in Philadelphia, Pa.
For 15 years in Philly, Jack and his girlfriend at that time had a small catering business. They specialized in events such as “Murder Mystery Dinners” and “high tea” for soap operas. Life went well until a disaster struck Jack’s life. After one of his catering gigs, he was caught off-guard on the streets by a local gang who demanded money from him. The altercation ended badly – Jack was stabbed three times on his side and stomach. Miraculously, Jack survived. Once he got a little better, he tried to run his business, but it was not successful – the situation really took him out of the loop. Finally, after his girlfriend left him, Jack decided to really make a difference in his life and move to San Diego. With just a couple of thousand dollars in his pocket, Jack figured he would get a job in no time. But the hiring process in San Diego proved to be a long one. Within a month, Jack ran out of money and ended up on the streets. Jack admitted that his ego wouldn’t let him ask for help. “I was always the one helping others,” he told me. “Now, I had to learn how to ask for help. It took me some guts to get a bunk bed,” he said. Jack stayed in the shelter for two months. He told me that he read 230 books during that time to get his mind off what was happening around him. That’s when Jack joined our Freddie Evarkiou Culinary Arts Program (CAP) at the Village. Because he had no experience working for a professional catering company before, just for himself, Jack knew he had to learn the terminology and all of the ins-and-outs of that environment. Before he completed six months of the program, Jack got a job at the W Hotel here in San Diego. There, he was the man behind the scenes making everything from scratch. He also recommended to the W six other CAP students who got hired after they graduated. In a few months, Jack was up for a promotion at the W. The same week, his friend called him to let him know that the Del Mar Racetrack was looking for a chef for their racing season. After he found out he didn’t get the promotion, he knew what to do – he called his friend back right away. After the interview with the racetrack, Jack was hired on the spot. Following the season at the racetrack, Jack decided to venture off to the culinary mecca of Las Vegas. 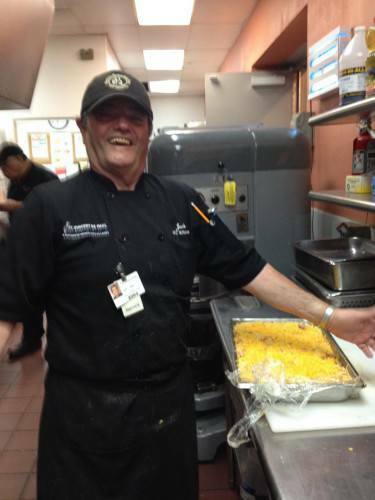 Jack worked at Tropicana for almost five years before he decided to move back to San Diego. The Village had a cook position available at one of the kitchens, and Jack’s amazing skills fit perfectly to our needs. This time, Jack came back to the Village to be a valuable staff member. This November, Jack has celebrated his three-year anniversary at the Village. He is close to retiring, but he does not want that to stop him from working. “As long as I am healthy, I am going to work,” he told me. Jack does have a retirement project though. He wants to write a cookbook to feature some international cuisine he tried during his travels and, more importantly, thoroughly explain how to make the recipes come out perfectly every time. “Sometimes recipes do not come out right. My goal for the cookbook is to show the right steps to building layers of flavors,” he said enthusiastically. Jack, indeed, is a very interesting former client. Please join me in congratulating him on his anniversary and successful journey in pursuing what he loves.